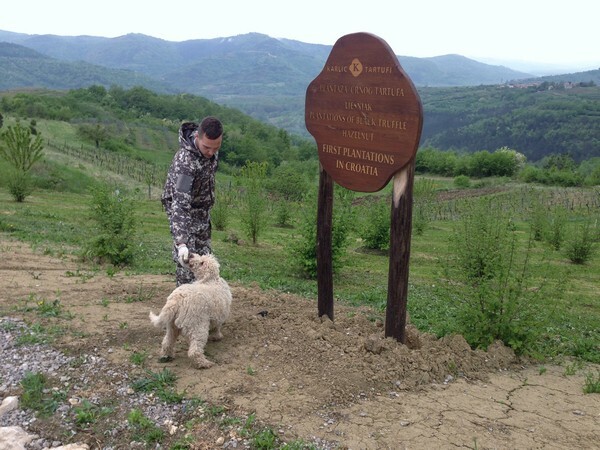 There were so many great experiences that the Accidental Locavore had in Croatia, but one of the it-probably-only-exists-in-your-fantasies ones was the morning we got to go hunting for truffles. 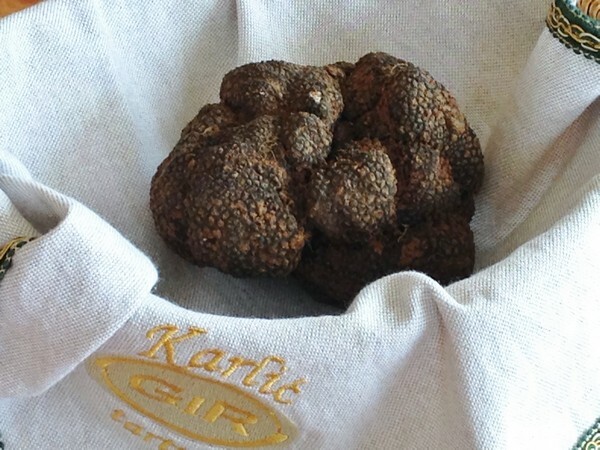 We met early one morning at Karlic a large truffle purveyor supplying to a number of restaurants. 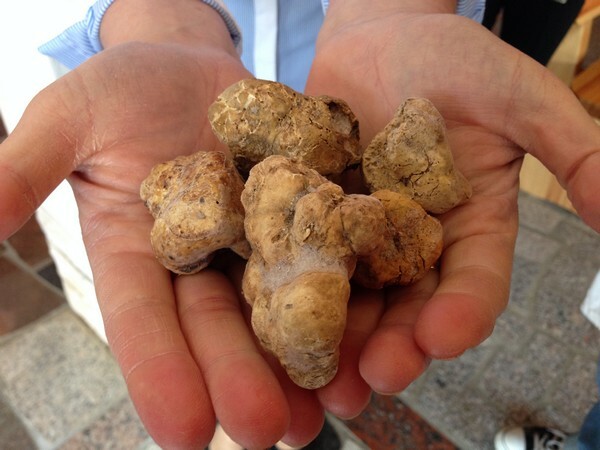 They produce both black and white truffles, depending on the season, and employ a team of 250 local truffle hunters to keep them well stocked. 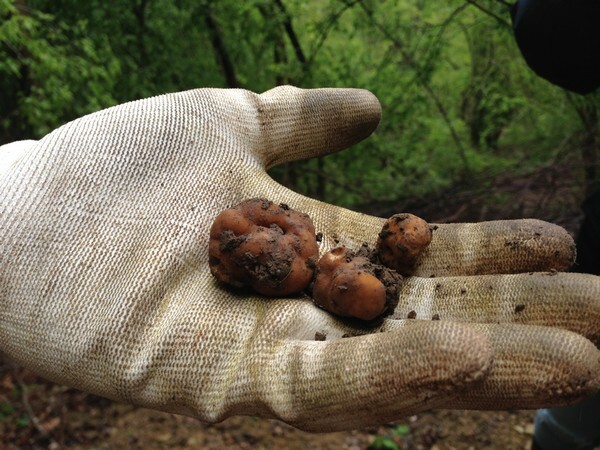 Because it was April, we were going to be looking for black summer truffles. 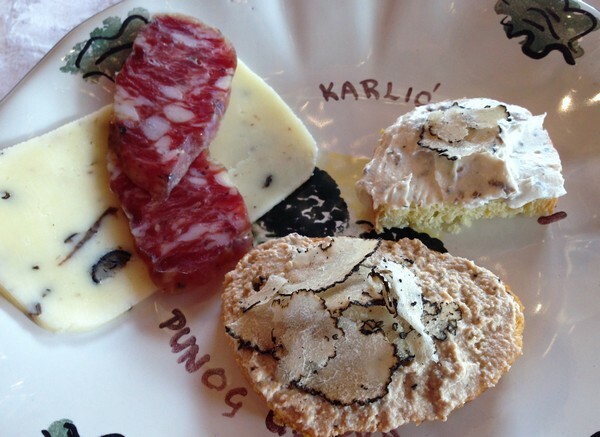 Before we took off we were treated to brunch–all dishes featuring truffles (naturellement). After a welcome drink (at 10:00 AM) we enjoyed appetizers, including pâté with white truffles, cream cheese on toast, also with white, a lovely local cheese with black along with salami studded with more black ones. 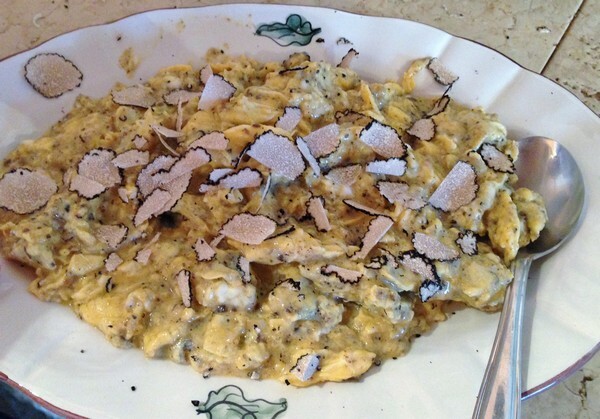 That was followed by scrambled eggs with black truffles. Well-nourished, we went out to start the hunt. They have a pack of eager dogs (no one uses pigs anymore), mostly females because “they listen better” and we took three of them, Betty, Candy and Blackie out to the woods with us. For a tiny village (population 42), Buzet has a dog population of over 100. Yes, they take their truffle hunting seriously! And even though these are generally mixed breeds, they are not your run-of-the-mill rescue dogs. The dogs go for anywhere from $2500 to $5000 depending on their background and take a year to train. Blackie is one of the most successful truffle dogs in the area and her owners have been offered over $10,000 for her (and turned it down). With Ivan, our guide, appropriately attired in camo, we took off for the woods. Although the woods are public property, the field we started off in belongs to Karlic and they have begun what they hope will be a lucrative truffle plantation. 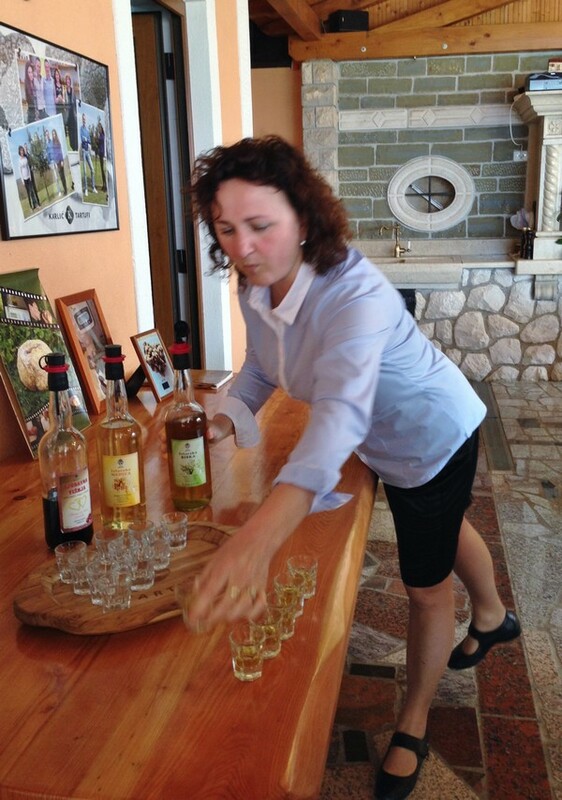 Eight years ago, they started planting 1200 oak and hazelnut trees, hoping to cultivate truffles. 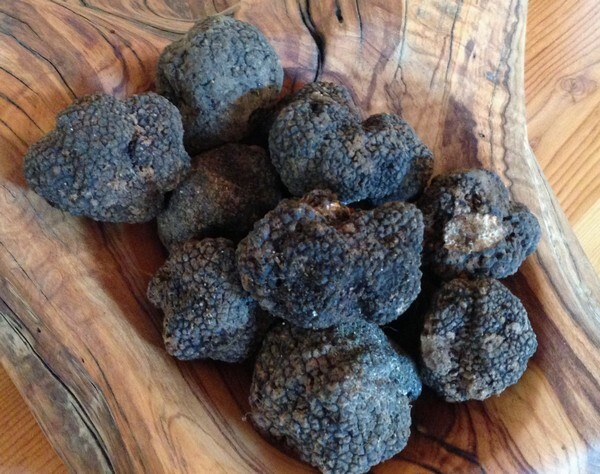 Although it generally takes ten years to start to find truffles, they found their first one last year and have already found over eighty this year, so it looks like their gamble will pay off. Past the plantation, we followed Ivan and the dogs into the woods. The dogs took off immediately, frolicking around, running up and down the hills. Suddenly Ivan would start running after one of them, usually Blackie, and we would try to catch up, eager to see if she had found anything. If she had something she would start digging and Ivan’s job was to catch up to her before she started to eat whatever she discovered. That’s not as easy as it sounds, as the dogs were often way up in the woods, and running up and down steep terrain is a workout! We learned too, that Blackie has been known to eat about a kilo (2.2 pounds) of truffles in a season – literally eating into the profit margins! With the dogs, we found five truffles in a little over an hour. That was the good news. The bad news was that none of what was found was edible. Who knew there were red and yellow truffles?